The election for the next president of South Korea is likely to take place on May 9, the last day of the 60 days stipulated by law to fill a vacancy in the nation’s highest office. In a historic ruling Friday, the Constitutional Court expelled Park Geun-hye, the 17th president of South Korea, from office, making her the first democratically elected leader to lose her position by impeachment. 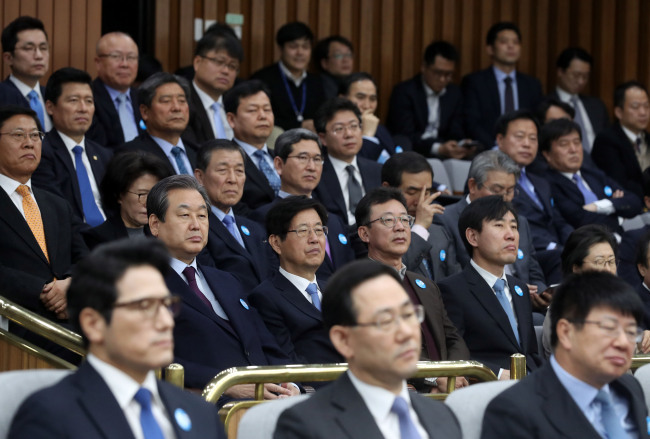 Political camps and presidential aspirants across the aisle now face a very tight schedule to prepare for the election, the exact date of which must be set by acting President Hwang Kyo-ahn by March 20. Political parties will have to finish selecting their presidential candidates by April 9 at the latest, as those planning to run are required by law to resign from public office 30 days prior to the polls. Several provincial governors and mayors are in the presidential nomination race of both the conservative and liberal camps. The main opposition Democratic Party of Korea, currently enjoying a clear lead in popularity polls, is ahead of other parties in its preparation. It plans to hold four rounds of primary elections from March 22 to April 3. If there is no majority winner, the party will hold a runoff vote on April. 8. Its primary contenders, former head of the party Moon Jae-in, South Chungcheong Province Gov. An Hee-jung, Seongnam Mayor Lee Jae-myung and Goyang Mayor Choi Sung participated in the party’s primary debates on March 3 and Monday, and will appear in eight more, with the next to be televised Tuesday. The party will establish an election committee Saturday and come up with a campaign roadmap by Sunday, its floor leader Rep. Chung Woo-taik said late Friday. “We cannot help but prepare for the upcoming presidential election, starting from Sunday,” Rep. Chung said. The minor liberal People’s Party is expecting a competitive primary between former party chief Ahn Cheol-soo and former head of the Democratic Party Sohn Hak-kyu. Although the two continue to collide over primary rules, the party settled on an in-house voting date of March 28 to determine its presidential candidate. The splinter conservative Bareun Party, which was created by anti-Park lawmakers that defected from the ruling party last year, will also come up with a presidential candidate on the same day as the People’s Party. Rep. Yoo Seong-min and Gyeonggi Province Gov. Nam Kyung-pil are both pinning their hopes on courting a wider electorate. According to the latest poll by Realmeter on Thursday, the Democratic Party garnered 49.3 percent of support, above the ruling Liberty Korea Party which followed with 13.5 percent. The People’s Party posted 10.3 percent of support while the Bareun Party stood at 6 percent. Leading the pack of presidential hopefuls is Moon, who topped the list with 36.1 percent of support in the same poll. He ran against impeached former President Park in the last presidential election in 2012. Acting President and Prime Minister Hwang Kyo-ahn followed at 14.2 percent and Gov. An from Democratic Party posted 12.9 percent. Mayor Lee stood at 10.5 percent and Ahn from the People’s Party had 9.9 percent of support.